Wave Lakeview is a 30-story modernist apartment tower at 420 W Belmont Ave.
Apartments are available for immediate occupancy and occupancy as late as December at Wave Lakeview, which is nearing completion of a major renovation that includes an expansion of its amenities and all-new apartment finishes. Available studios rent from $1,540 a month, convertibles from $1,600, and 1-bedrooms from $1,549. Two-bedrooms with 1 ½ baths are all rented at this time. Visit Wave’s website for rent and availability info. Kitchens have lacquered matte painted-look custom European style cabinetry with soft-close drawers, polished white quartz countertops, white glass mosaic tile backsplashes, Energy-Star rated stainless steel appliances, under-mount sinks, and chrome gooseneck faucets. Bathroom finishes include porcelain tile floors with stacked subway tile, custom lacquered-painted-look vanities with 3-inch thick porcelain slab vanity tops with integral sinks, contemporary chrome faucets, curved chrome shower rods, and a custom LED wall sconce. 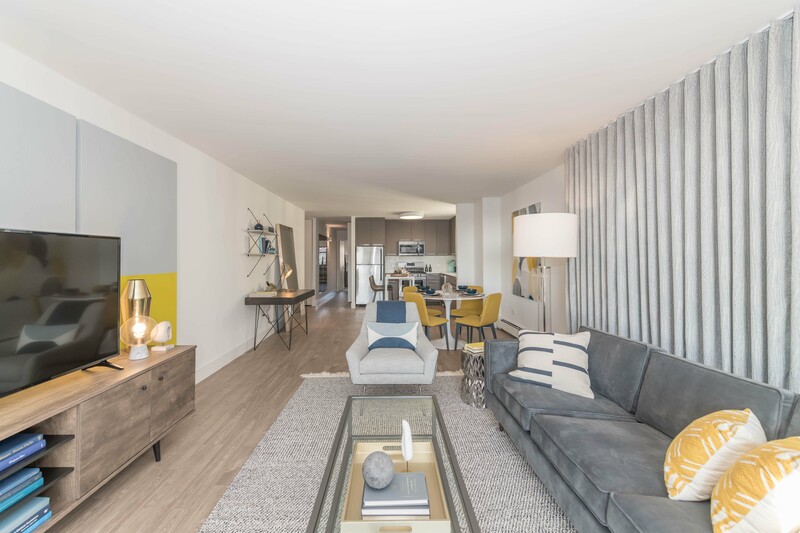 Apartments have matte finish wood-look plank flooring throughout, custom-designed high-efficiency LED light fixtures and solar fabric shade window treatments. Higher-floor south-, north- and west-facing apartments have sweeping views. 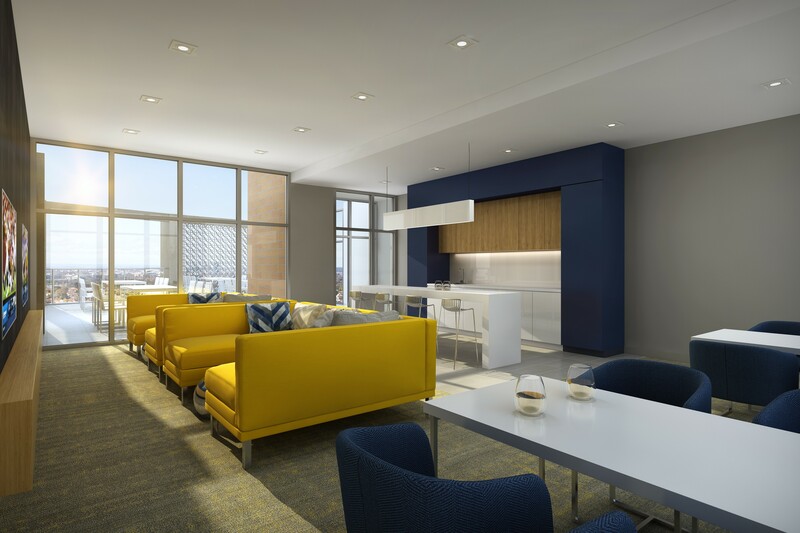 Wave Lakeview has unusually extensive amenities for the location. 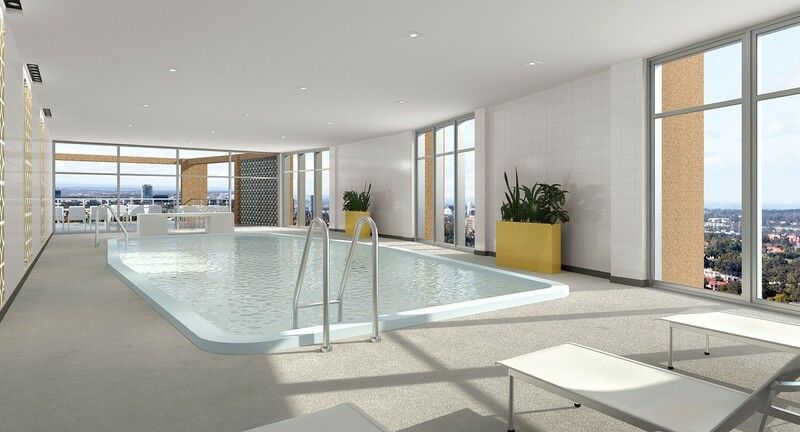 There’s a 30th-floor indoor pool, resident lounge and sun deck. Wave also has a fitness room, a yoga / Pilates studio, a package receiving area, Pressbox dry cleaning service, resident storage spaces, and on-site garage parking. The building is in a predominantly residential part of Lakeview East that’s often referred to as Belmont Harbor. The location affords residents quick access to the park, the harbor, Lake Shore Drive, and the miles-long strip of bars, restaurants and shops along Broadway and Clark. Wave is pet-friendly, subject to limits. Wave has on-site management and leasing staff, and 24/7 door staff.